Please note that this event complies with Maine Medical Marijuana Laws. No sales of any Cannabis product are allowed. Must Initial Below: If you do not comply you will be removed from the trade show with no refund. MMCM Members will have discounted prices for their booths. Food is only available through the Civic Center concessions on site. Exhibitor & Vendor booth(s) are expected to be staffed & on display from open to close on June 1st & June 2nd, 2019. 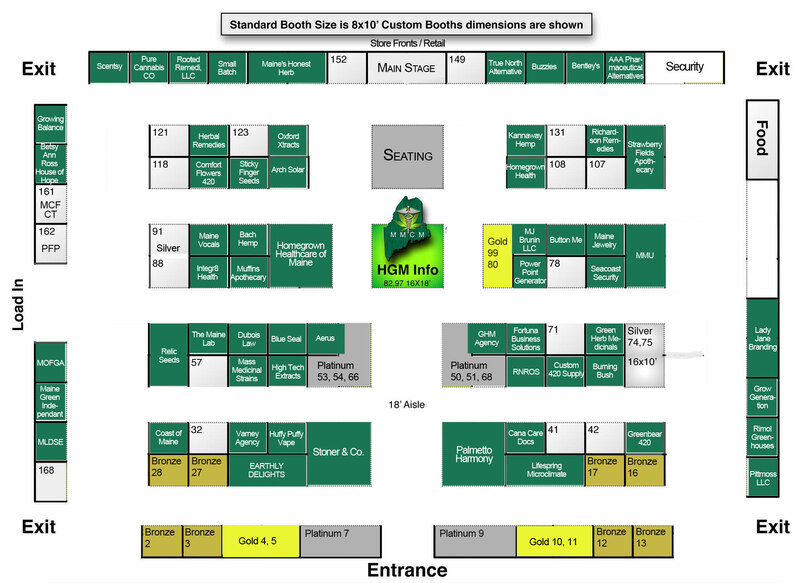 Exhibitors & Vendors may not remove trade show set up & booth until 5pm Sunday June 2nd, 2019. NOTE: THERE WILL BE A $100.00 PENALTY FOR EARLY TAKE DOWN: Must Initial Below; (even if you run out of product) so please bring extra information or product for your booth. Please make sure at closing time you take anything of major value with you. We will not be responsible for lost or stolen items. Please note: all Cannabis needs to be removed when booth is closed. All Cannabis needs to be under your supervision at all times. No SMOKING of CANNABIS OR TOBACCO is ALLOWED on CIVIC CENTER PROPERTY. We have provided a patient tent area for VAPORIZING ONLY. The Patient Vaporizer Tent located outside the facility, is available to qualified patients with Maine State MMJ Medical Recommendation and will be open during the show. Can't attend the Home Grown Maine event this year? MMCM will be handing out 1000 cloth swag bags at the event to the first 500 that arrive Saturday and 500 Sunday! Hundreds more bags will be handed out over the course of the event! For a small fee we can include YOUR business info into the swag bags to get the word out and generate new customers! Fill out the form below and get us your SWAG for the bag! Simply provide us your cards, flyers, and/or small promotional items to include in the bag! Please get in touch with us ASAP so you can get in on this amazing opportunity to reach thousands of potential customers! The “Captains of Industry Fundraising Dinner” will be held at The Augusta Country Club, from 5pm to 10pm This dinner is for everyone and anyone that would like to attend. Come join us on this special night of celebrating our 8th ANNUAL HOME GROWN TRADE SHOW. This event is a fundraiser for MMCM with a minimum donation of $50.00 per person per ticket, which includes the buffet (gluten-free, dairy-free and vegan option). There will be a cash bar and live music as well. Please make checks payable to: MMCM or pay with credit card (add 3% processing fee if paid by Credit Card) For phone payments contact Cheryl at MMCM 207-596-3501 to ensure you have a submitted application before making payment.